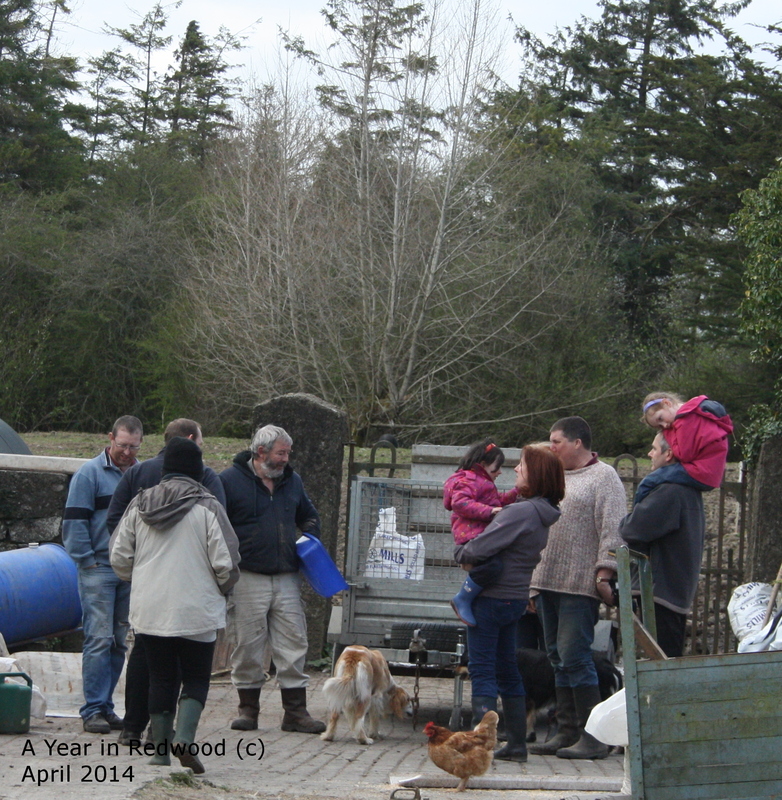 Yesterday, saw me up early again (OK, not quite so early) for my own education, my Pig Rearing (one day) Course all the way down in Tipperary, almost a 2 hour drive. This proved to be a thoroughly enjoyable and brilliant day in which we all learned a huge amount and, in my case, finally got to get hands-on with live pigs; we’d been feeling a bit like ‘book experts’ with both pigs and the bees – a wealth of ‘book-learning’ but zero practical experience! The course happened at Old Farm, near Portumna in North County Tipperary which is a lovely small holding centred around a beautiful old house and with a goodly rambling collection of outbuildings and ‘Pop Larkin’ style piles of “stuff” which are all works in progress and projects which will get completed “when there is time”. The people were a superb couple, Alfie and Margaret, friendly and welcoming but obviously capable, practical and very knowledgeable, him a stockily built former off-shore commercial diver (North Sea Oil Platforms etc) and later diving instructor all around the world, a natural speaker and presenter with a fascinating style of training which had us all gripped, engaged and amused throughout. Margaret took more of a support role, on this course anyway, and looked after the admin and catering side of things but she is an award winning Blog Writer with a very enjoyable ‘voice’ (by her own admission sometimes given to rants against officialdom in the food industry). Her ‘A Year in Redwood’ blog (https://ayearinredwood.com/) has won “Best Blog of an Artisan Producer (Ireland and UK) 2014” and Best Lifestyle Blog 2012. She served up scones and coffee as we arrived and a superb lunch which gave us a choice of pork meatballs in tomato-y sauce or casserole of sausages and chick peas, all their own pork, naturally. They are both driven advocates of all things organic, welfare, free range, low food-miles, Transition-Town and non GMO and were a big part in establishing a Free Range outdoor pig Quality standard mark (Q-Mark) within the Irish ‘Bord Bia’ food production quality standards people. Prior to that Bord Bia officials were almost entirely interested in meat for export and pigs by the tens of thousands from “nice clean, healthy” factories, all pink and free from mud, but who never see the daylight or (gasp!) dirt from which they might catch disease. Old Farm had quite a task on their hands trying to get Bord Bia to even come and have a look at their small production set-up, which was interested more in local markets and where pigs went (another gasp!) OUTSIDE and got muddy! Alfie raves against their rules which do not allow him to use brewers grains from the local organic micro-brewery or whey from the local organic cheese maker in his feeds. He despairs that he can sell pork mince but not as meat balls or burgers – for us the lunch had meat balls with (fresh) chopped onion and herbs in and their own eggs to bind them, where commercially he’d have to use sterile, dried onion and herb and some kind of chemical gloop to bind. The pigs were an obviously happy, healthy collection which he keeps as full families. One enormous Saddleback sow was showing off 4 remaining youngsters in one pen, and we rousted another whole gang out of their siesta during our walk-about – a massive cross-bred boar, 2 huge sows, one pregnant and the other with 8 4-month old piglets ‘at foot’. Further round still were a group of market-ready boys and girls who we could scratch, tickle and get to know a bit better; the piglets with sow and the big old boar we had to just admire over the fence. I was amused to find that the 8 piglets were not some kind of blurry mix of all the breeds of pig in their make up, but were all different and all close to one or another of them, so you had recognise-able black and white “nearly Saddlebacks”, Gloucester Old Spots, Duroc and so on. I could see immediately what is meant by pigs being like rotovators, rooting up the ground and clearing any brambles and weeds. The pig pens were finally reasonably dry after a very wet winter and were now a grass-less, dark brown/black crumbly tilth which you could have raked smooth and planted veg straight into. There was not a weed or leaf anywhere. Old Farm keep quite a few pigs and have them all year round, so they rest fields regularly and even have doors both ends of their pig arks so that they can split fields with electric fencing and the pigs get access to the ark from either half. All in all an excellent, enjoyable day and a superb course. Thank you Alfie and Margaret and the menagerie at Old Farm, and also to my co-students who were all a great bunch, all beginners like us. Good luck with your own pigs; I think we were all going to go ahead with pigs; even those who were a bit undecided to start with and were on the course to see if they still thought it was a good plan. My only ‘negative outcome’ (as they say) was that Old Farm are firm advocates of electric fencing throughout, and Alfie was a bit doubtful (though politely and nicely so) whether my style of fencing would do the job, but we’ll see. If Mapp and Lucia manage a breakout and we find them picking up their own windfall apples, we can always add electric fence strands at a later date. Your course sounds great, Margaret. I can’t believe you can’t sell your own mince as value-added products like meatballs or burgers. If you have to use some egg substitute and chemically treated seasonings, does that mean that there are no organic burgers in Ireland? I dehydrate my own organic onions and garlic for seasoning – would you be allowed use that? To be honest, many food laws confuse me. Things seem much more relaxed here in that regard. Then, I’m not currently trying to sell anything, so maybe I’m just blissfully unaware. Thanks for the lovely comments. The course does always seem to go down well with participants. As I say to them… if they leave at the end of the day saying pigs are not for me….. they have learned! I’ve just read Matt’s blog on his day doing the course and its made me look even more forward to attending your next course on Sept 14th….. Thanks Mary… we keep in touch with Matt via blogging since!